This should have been a big year for the Girl Scouts. But before they could blow out their 100 birthday candles, they got sucked into the kind of political firestorm that would have killed the organization’s founder if she weren’t already dead. Curiously that intersection of the past and present pops up consistently in Kathy Cloninger’s “Tough Cookies: Leadership Lessons from 100 Years of the Girl Scouts”. As a result, Ms. Cloninger (who was CEO from October 2003 through November 2011) has produced something that isn’t just one book – it’s four. And that is both its value and its shortcoming. First, there’s the history of the Girl Scouts. In popular American culture, this story is often just a footnote to the story of the Boy Scouts. But the Girl Scouts is actually a much more remarkable story. A fifty year old widow from Georgia who’s studying sculpture in Paris in 1912 meets Boy Scouts founder Baden-Powell and is so intrigued by the principals of self-reliance and the outdoors that she immediately sets sail for home and determines to set up a similar program for girls. Girls? In 1912? Out in the woods? Playing basketball? Just imagine selling that concept in. But she did. And since then, the Girl Scouts has expanded to more than two million girls (and nearly a million adults) and taught leadership skills to such famous Americans as Hillary Clinton, Elizabeth Dole, Condelezza Rice, Sandra Day O’Connor, Gloria Steinem and many others. Quite an impressive roster that, whichever side of the aisle your politics sits on. And it also helped a latchkey kid from Dallas who waited tables to put herself through Community College, and eventually became CEO of Girl Scouts of America. And that’s the second book – the story of Kathy Cloninger. And it’s a good one, because not only is it the kind of Horatio Alger story that America loves, it’s also a living breathing example of the impact the Girl Scouts can have. Because while not every little girl is going to grow up to be a Supreme Court justice, every little girl does need to learn how to be a leader. How to work with others. How to overcome obstacles. How to get things done. Like Kathy Cloninger did. Which leads to the third story – the one that answers the “Do we still need the Girl Scouts?” story. The “Why can’t girls learn leadership skills – or whatever it is the Girl Scouts are teaching – in school, or from popular culture, or from their parents, like boys do?” argument. And Cloninger’s answer? On the one hand she makes the case that popular culture has got girls so confused about themselves as sexual objects that they can’t think straight and need a place outside of popular culture to learn those skills. And the Girl Scouts provides that place. She also argues that strong girls – and therefore, in time, strong women – make a strong economy. This is the same case that Nicholas Kristof and Sheryl WuDunn make in their 2010 bestseller “Half the Sky”. And they’re convincing arguments. Unfortunately, the Girl Scouts weren’t delivering on them, which prompted Cloninger to lead a massive re-organization in 2004. And that’s the fourth book. “Reorganization” books are always a challenge. Generally, the author doesn’t want to air the dirty laundry, doesn’t want to go through (again) the battles that they just finished fighting. Because they fought those battles so they could get past them – and get to the productive future. But that’s exactly what others want to know. Not for prurient reasons (well, not always). But so they can learn. Others learn from your dirty laundry. The very details about specific unexpected problems that you had to overcome – and that you don’t want to talk about – are exactly the things that can help others succeed. And while one can appreciate why Ms. Cloninger doesn’t go into these details, one must admit that this is a tremendously missed opportunity. A book on these four topics could easily have run to a thousand pages – and because “Tough Cookies” is only about 180, it’s necessarily choppy and scattered. Indeed, Cloninger has set herself so many tasks that she really never goes deeply into any of them – resulting in a book that is disappointingly thin and superficial. That said, in an age of severe economic global challenges, any book that argues for making us successful by making strong women out of strong girls, shouldn’t be ignored. One just wishes the book were a stronger too. 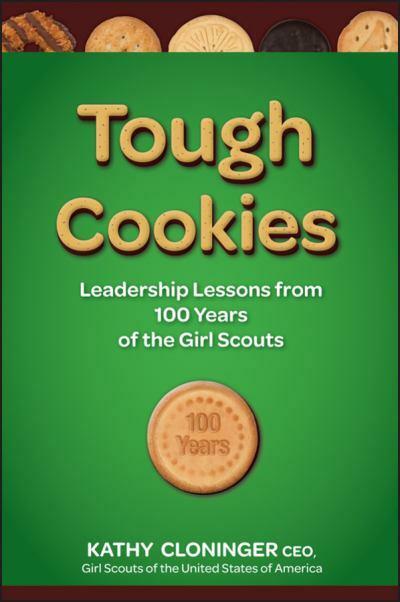 Tough Cookies: Leadership Lessons from 100 Years of the Girl Scouts by Kathy Cloninger was published by Wiley on 10/18/11 – order it from Amazon here or from Barnes & Noble here – or pick it up at your local bookseller ( find one here).